Butternut is a shade-intolerant species (Lupien 2006). To promote the health of butternut stands, it is important to maximize the amount of sunlight available to the trees by carrying out thinnings in which associates of butternut are removed along with severely infected butternuts that cannot be saved (DesRochers & Lupien 2008; Turbis & DesRochers 2008).High-value butternut trees in ornamental plantings should be fertilized to increase their vigour (Oliver 1980). Interventions are aimed at protecting healthy trees. Infected trees in forest stands or managed woodlots must be cut down as quickly as possible to salvage the merchantable wood. Dying and dead trees should be felled and the wood disposed of to promote regeneration and reduce the inoculum load. In butternut stands, all trees that have at least 30% crown dieback and cankers covering at least 20% of the circumference of their main stem should be removed, as should trees with more than 50% crown dieback even if they have no trunk damage (Ostry et al. 1994, 1996; Davis & Meyer 2004; DesRochers & Lupien 2008).The gap-selection method can be used to promote butternut regeneration provided that the diameter of the gap that is created is equal to or twice the height of butternut. This should be implemented on optimal sites for butternut, such as rich fertile lowland areas and south-facing terraces bordering the St. Lawrence in southern Quebec (DesRochers & Lupien 2008). Control of competing vegetation will allow young butternut to become established in these openings (Ostry et al 1994). There are no fungicides registered in Canada for the control of butternut canker, although benomyl, chlorothalonil and potassium bicarbonate have proven effective in laboratory studies (EPPO 2005; Srivastava et al. 2005). There are no known biological controls for butternut at present (Anderson [ND]). Selecting resistant species for walnut plantations may be a useful approach. Japanese walnut (Juglans ailanthifolia Carr.) is resistant to butternut canker (Michler et al. 2006; Sinclair & Lyon 2005). There appears to be a few resistant phenotypes of butternut (Michler et al. 2006). Retain all butternut trees that have no trunk damage and no more than 50% crown dieback, along with trees that have less than 30% crown dieback and cankers covering less than 20% of their main stem and their buttress roots (Ostry et al. 1994, 1996; Davis & Meyer 2004; DesRochers & Lupien 2008), because they may be resistant to butternut canker and become a source of material for breeding of resistant seedlings. To identify resistant butternut trees, it is necessary to identify some affected butternut within a radius of less than 30 m to ensure that these trees have been exposed to spores of S. clavigignenti-juglandacearum; these trees should also be at least 26 cm in diameter. 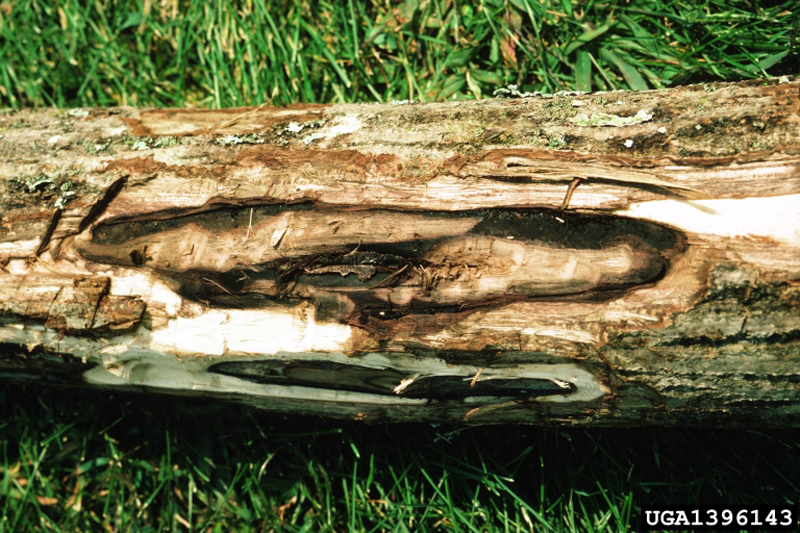 If there are cankers on the trunk, the tree must have been able to successfully overcome them (Ostry et al. 1994). Provide a maximum amount of sunlight to promote the health of butternut trees. Fertilize highly valuable ornamental butternuts. 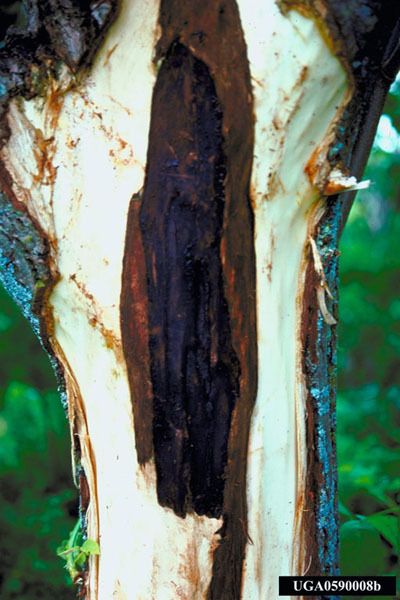 Remove infected trees in order to reduce the amount of inoculum in the stand. In butternut stands, all trees with at least 30% crown death and 20% or more of the circumference of their trunk affected by cankers should be cut down and disposed of. Trees with no trunk damage that have 50% or more crown dieback must also be removed. In natural stands, butternut that have no damage on the trunk and less than 50% crown dieback, as well as butternut with less than 30% crown dieback and less than 20% of their main stem affected by cankers, should be retained. 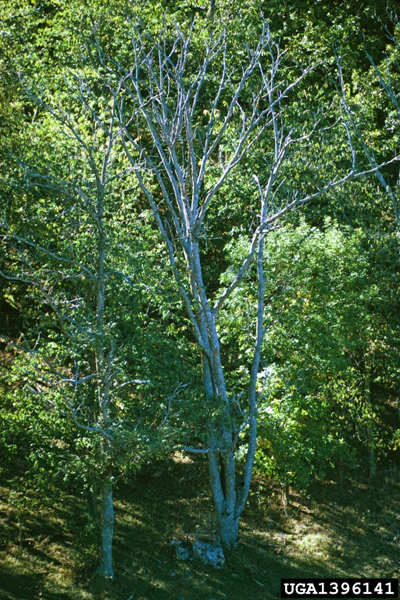 Landowners who think they may have some resistant butternut trees should identify them and fill out the survey provided by the Forest Gene Conservation Association [SD] (http://www.fgca.net/home/default.aspx). Note, however, that so far the survey is only intended for Ontario residents. 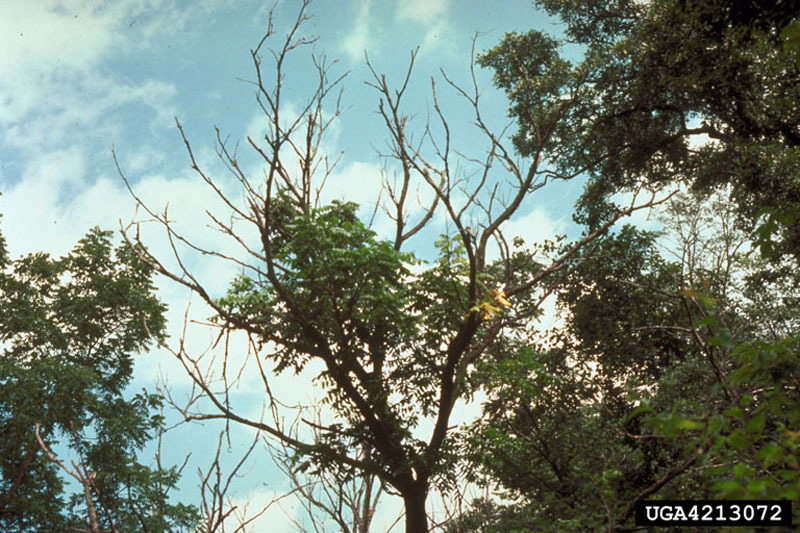 In nurseries, destroy young trees that carry the disease. Do not grow seedlings from contaminated nuts (CCDMD 2009). 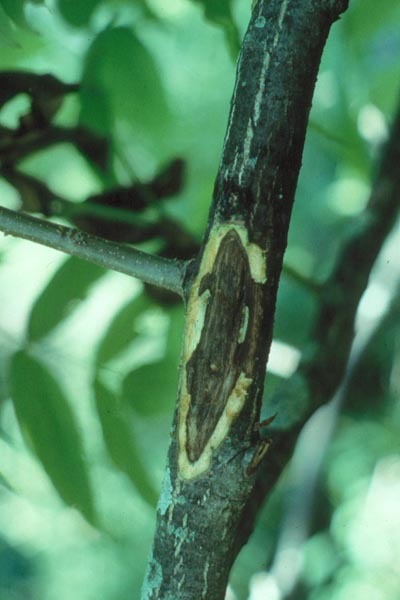 In plantations and ornamental plantings, one should prune and destroy infected branches and also destroy infected nuts, given that the disease is transmitted by fungal conidia present in the cankers or on lesions on the husk of contaminated nuts (CCDMD 2009). Excise cankers from the trunk of valuable butternut trees. Felled trees and pruned or excised wood must be buried or burned. Anderson, R.L. [SD]. Butternut Canker. USDA Forest Service, Southern Region - Forest Health. http://main.nc.us/SERAMBO/BControl/butternut.html#bcpotentials consulté le 2 octobre 2009. BNQ (Bureau de normalisation du Québec). 2001. Entretien arboricole et horticole. Norme NQ-0605-200/2001, 153 pp. Centre collégial de développement de matériel didactique (CCDMD). 2009. Maladies des arbres du Québec. http://rea.ccdmd.qc.ca/ri/arbres/# consulté le 13 janvier 2009. Desrochers, P. et Lupien, P. 2008. La sylviculture et la santé du noyer cendré, Colloques du SCF-CFS du 20 novembre 2008. Disponible sur le PIF http://www.partenariat.qc.ca/videoconferences_2008.html consulté le 22 janvier 2009. Forest Gene Conservation Association [SD]. http://www.fgca.net/home/default.aspx consulté le 23 janvier 2009. Lupien, P. 2006. Des feuillus nobles en Estrie et au Centre-du-Québec – Guide de mise en valeur. Association forestière des Cantons-de-l’Est, Sherbrooke, 268 p.
Michler, C.H. ; Pijut, P.M.; Jacobs, D.F. ; Meilan, R.; Woeste, K.E. and Ostry, M.E. 2006. Improving disease resistance of butternut (Juglans cinerea), a threatened fine hardwood: a case for single-tree selection through genetic improvement and deployment. Tree Physiol. 26: 121-128. Ontario Government. 2010. Endangered Species Act, 2007 - Ontario Regulation 242/08 http://www.e-laws.gov.on.ca/html/regs/english/elaws_regs_080242_e.htm . Accessed June 7, 2010. Ostry, M.E. ; Mielke, M.E. ; Anderson, R.L 1996. 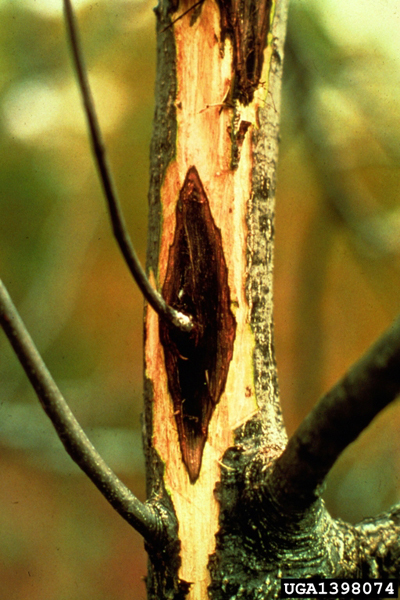 HOW to Identify Butternut Canker and Manage Butternut Trees. HT-70. [Radnor, PA]: U.S. Dept. of Agriculture, Forest Service, Northern Area State & Private Forestry. Ostry, M.E. ; Mielke, M.E. ; Skilling, D.D. 1994. Butternut-strategies for managing a threatened tree. Gen. Tech. Rep. NC-165, St. Paul, MN: U.S. Department of Agriculture, Forest Service, North Central Forest Experiment Station, 7 p.
Sinclair, W.A. and Lyon, H.H. 2005. Diseases of trees and shrubs - Second edition. Comstock Publishing Associates, Cornell University Press, Ithaca, New York, pp. 116-117. Srivastava, K. K.; Ostry, M. E.; Sunil Kumar. 2005. Efficacy of ArmicarbTM 100 against Sirococcus clavigignenti-juglandacearum (a butternut canker pathogen). Indian Journal of Forestry 28: 162-163. Turbis, C. et DesRochers, P. 2008. Est-il encore possible de sauver le noyer cendré ? L’Éclaircie du Service canadien des forêts - Centre de foresterie des Laurentides No 47, 2 pp.